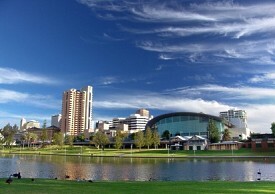 Adelaide is known as a sophisticated city that has preserved its heritage and links with the past and offers a wealth of tourism experiences that are readily accessible from the city. The food and wine experience starts downtown with the National Wine Centre, Adelaide Central Market, vibrant cafes, restaurants boasting some of Australia’s best chefs and events such as Tasting Australia. The Bradman Collection, Adelaide Botanic Gardens and Bicentennial Conservatory, numerous museums along North Terrace, historic Port Adelaide and popular metropolitan beaches are just some of the many reasons to visit Adelaide. Exit the airport and get onto Sir Hubert Wilkins Rd. Turn left onto Sir Donald Bradman Dr/A6. Use the right two lanes to turn right onto Tapleys Hill Rd/A15 and drive for 8km. In about 15 minutes you will reach A7, use any lane to turn left onto Port Rd/A7. Follow this to your destination on St Vincent St at 296 Saint Vincent Street, Port Adelaide.